just up the pike: is "somoco" the new phrase or something? is "somoco" the new phrase or something? "SoMoCo"? Just when I thought I knew what the lingo was, someone throws a curveball my way. Check out this fresh Google Map of "SoMoCo", "Downcounty", and all your favorite abbreviated MoCo territories. In our fast-paced, time-starved world, referring to things by their full names has become a luxury available only to the few. 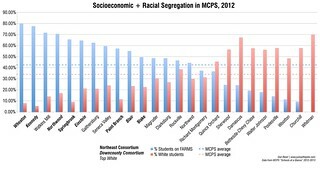 That's why we've shortened the name of our fine county to "MoCo." 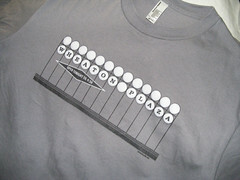 What better way is there to say "seventh-wealthiest county in the nation" in so few syllables? 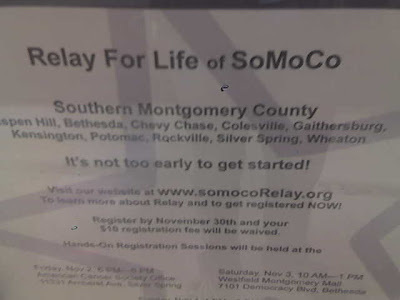 Nonetheless, I was quite shocked to hit up the Colesville Giant last week and see this flyer for "Relay For Life of SoMoCo 2008," organized by the American Cancer Society. It goes on to read "including the cities of Aspen Hill, Bethesda, Chevy Chase, Colesville, Gaithersburg, Kensington, Potomac, Rockville, Silver Spring, Wheaton." At Just Up The Pike, there are very few things I can hold self-evident. Times change, opinions change, but my location always stays the same. So far as I know, I live in East Montgomery County. This blog was founded on my living in East County and being frustrated about The Rest of The County. Before that, I wrote in my high school paper about the East-West divide, even if there isn't a place we call West Montgomery County. westward ho? or not? there's so much more AFTER THE JUMP . . .
And you - the American Cancer Society (the "ACS"), whose unfailing commitment to saving lives should be commended - just dropped a new iron curtain over MoCo, a place already grappling with so many arbitrary boundaries. But this one goes right over my house and through the places I spend the most time in, not to mention right across The Pike. I do not quite live in the City of Colesville ("C-Ville," as some people call it), nor do I reside in the great Metropolis of Burtonsville ("B-Ville," as other people call it): I live in between them. There used to be a time when the Upcounty was up and the Downcounty was down and between them lay a great swath we called the Midcounty. And it was to them I would commute from my own East County, bereft of its own Things To Do other than hanging out in one of our many parking lots. I suppose those days are gone. Well, SoMoCo Relay for Life 2008 will be held this coming June, and we've got six months to tear this wall down before all those runners knock into it. Dan, I'm shocked you haven't heard of SoMoCo before! I've used that term (and to a lesser extent, NoMoCo) for years, although mostly as a joke. rtsind, are you advocating No Mo So Mo Co?